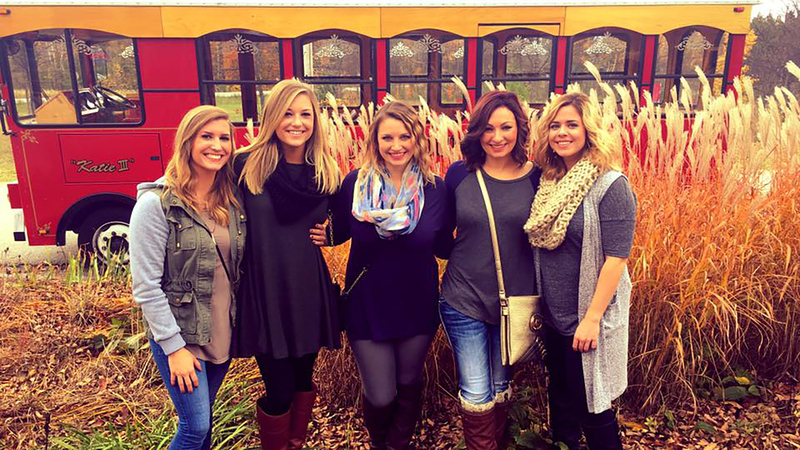 Summer & Fall tours: Narrated Scenic Tour, Premier Wine Tour, Lighthouse Tour, Ghost Tour, Haunted Pub Crawl, Wisconsin Supper Club Tour, Bloody Mary & Brunch Tour, Wine-Spirits & Brew Tour. New 2018 tours: Holiday Pub Crawl. Winter & Spring Tours: Winter Wine Tour & Sleigh Ride, Wine-Spirits & Brew Tour, Spring Blossom Tour. Limited seating. Call for reservations 920-868-1100. Dec-Apr, Trolley Station, Sa 9-3. Tours, Sa 10-3. 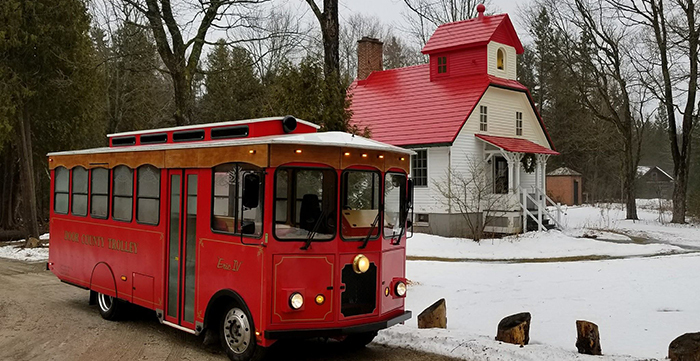 Our "Old Time" trolley will pick you up and navigate you to Door County’s most treasured lighthouses. Experience these majestic landmarks, tucked away in the Peninsula’s hidden bays and coves. Experience 3 fully guided tours at these unique lighthouses: Eagle Bluff Lighthouse, Cana Island Lighthouse, and Baileys Harbor Range Lights. Tour price includes made to order box lunch with sandwich, chips & beverage. Tour departs from the Trolley Station in Egg Harbor (8030 Hwy 42), at 10:00am Monday, Wednesday & Friday, June through October. $59.95 plus tax per person. Experience the VIP tour of the "Boutique Winery" area of the Midwest Wine Region. Meet one on one with the vintners of these individual wineries that produce treasured label, high quality wines. Each of the three Door County Award Winning Wineries visited will have "cellar door" tastings, emphasizing Red, White, Port (dessert) and Fruit Wines. Top it all off with a chef prepared lunch at the prestigious Fireside Restaurant. Tour departs from the Trolley Station in Egg Harbor (8030 Hwy 42) at 10:00am daily, June through November. Duration: 5 hours. Includes chauffeured trolley, wine tours and tastings and fabulous lunch. $66.95 plus tax per person. 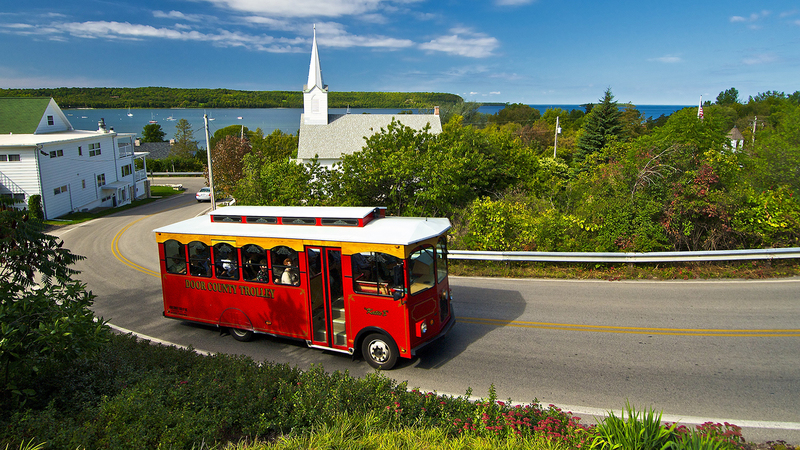 Take an "Old Time" Trolley ride and see breathtaking vistas from Door County’s scenic bluffs overlooking the islands. As we traverse the land, we’ll share the legend and lore unique to each area. Don’t forget to bring your camera! Learn from the locals the best places to wine, dine and relax. Tour departs from the Trolley Station in Egg Harbor (8030 Hwy 42). 3-4 Tours daily May through October. Duration: 90 minutes. $18.95 plus tax adults, $13.95 plus tax children (2-16 years old). Step aboard the "Trolley of the Doomed" as we share tales of ghostly sunken ships, haunted lighthouses and mysterious happenings on the darker side of this spirited peninsula. Join our scary, fun, and informative fright filled tour that is truly one of a kind. Tour departs from the Trolley Station in Egg Harbor (8030 Hwy 42) 7:00pm nightly June through September, 6:00pm nightly in October and November. Duration: 2.25 hours. $29.95 plus tax for adults, $21.95 plus tax for children (2-16 years old). Aboard the Murder & Mayhem Tour, you will weave through and retrace the steps of the Peninsula’s most wanted criminals, past, and present. Tour goers will be told the facts of the core stories of the suspects, clues and alibis, as to relive the scenes of the 6 crimes showcased. Hear the shocking stories, including "The Canal Shack Killing" and the infamous "Furnace Murder," just to name a couple. 5 days per week June through October. $29.95 per adult and $21.95 per child. This unique, haunted tavern tour will get you up close to the "spirits" of Door County. You’ll enjoy the "intoxicating" tales of the peninsula’s haunted pubs and taverns. The trolley tour will spend approximately 30 minutes in each of the four establishments. Tour departs from the Trolley Station in Egg Harbor (8030 Hwy 42) at 7:00pm. (Tuesdays, Fridays and Saturdays from June through August, Fridays and Saturdays in September and October, Saturdays only in November). Duration: 4 hours. $39 plus tax per person (May-Sept) & $54 in October & November (includes flashing souvenir skill mug). This tour is for ages 21 and older. Alcohol is not provided or required, but is available for purchase at the establishments visited. Valid I.D. is required and will be checked. Indulge in a Wisconsin tradition - Bloody Mary’s and Sunday Brunch. Trolley guests will enjoy three unique stops for those popular Sunday morning cocktails, Bloody Mary’s and Mimosas. Tour includes chauffeured trolley, three Bloody Mary’s or Mimosas and Sunday Brunch. Tour departs from the Trolley Station in Egg Harbor (8030 Hwy 42) at 10:00am on Sundays from May through November. Duration: 3.5 hours. $58.95 plus tax per person. 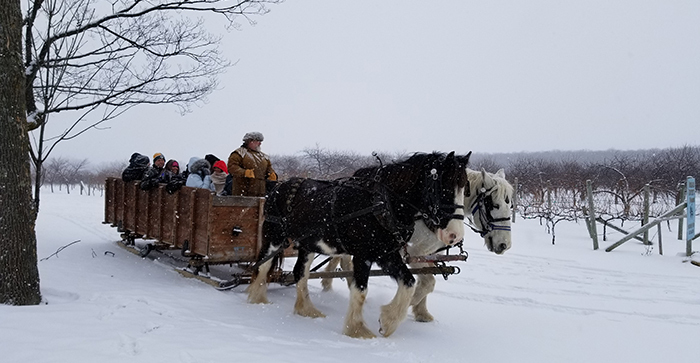 Trolley guests will taste at two Door County award winning wineries, followed by a cozy sleigh ride through "The Doors" most wintery landscapes, topped off with a fireside lunch at the romantic English Inn. Tour departs from the Trolley Station in Egg Harbor (8030 Hwy 42) at 10:00am Saturdays, December through March. Duration: 5 hours. $66.95 plus tax per person. 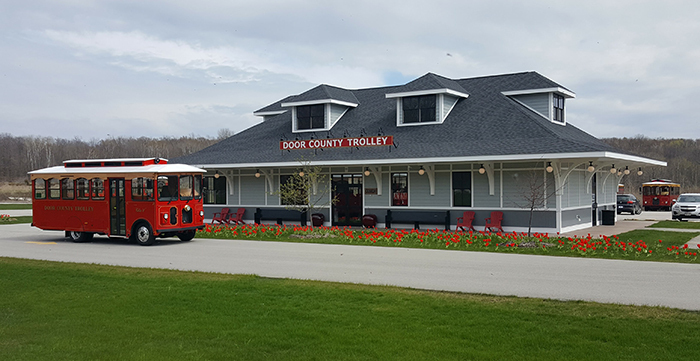 Trolley guests will partake in private wine tastings at two award winning Door County wineries. Followed by a cozy carriage ride through the quaint village of Fish Creek. Trolley navigates guests to the hidden peninsula blossoms, carpeted forest wildflowers and majestic scenic overlooks that this rejuvenated season brings. Top it off with a fabulous lunch. Tour departs from the Trolley Station in Egg Harbor (8030 Hwy 42) at 10:00am Saturdays, in April and May. Duration: 5 hours. $66.95 plus tax per person. Experience two Door County Wineries, Distillery and Micro Brewery. Each of the three stops will include private tastings at Harbor Ridge Winery, Starboard Brewing Company, Door County Distillery, Door Peninsula Winery & top it off with a fabulous lunch at Crate Restaurant in Sturgeon Bay or Log Den in Egg Harbor. 4 days per week. $66.95 per person. Book the Trolley for your weddings, family reunions, business group or next birthday party! Memories are made by remembering the past. We go anywhere! Capacity of 25 to 29 individuals. In-trolley speaker system. Comfortable, cushioned seats. Heated and enclosed for year-round comfort.